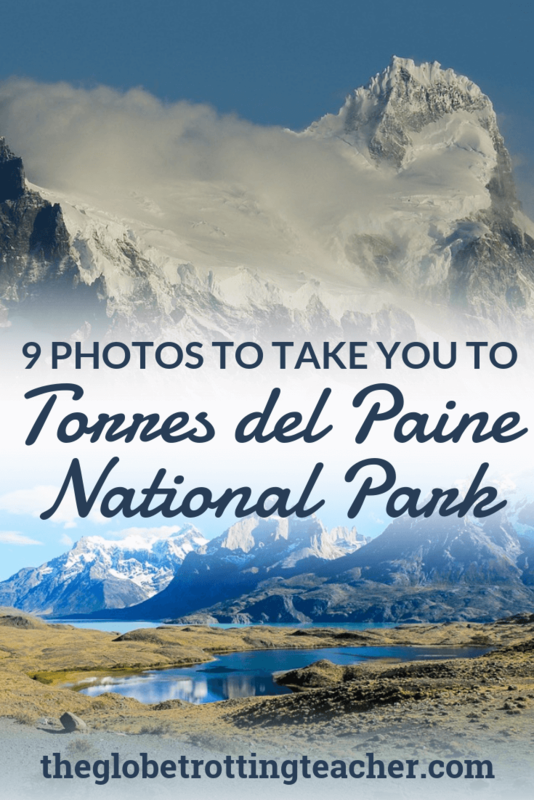 Visiting Torres del Paine National Park for the first time is one of those tingly moments you know instantly will stick in your memory. 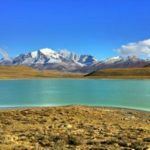 It is a UNESCO World Heritage Sight well-known for its crystal blue glaciers, jagged mountains, and turquoise lakes, as well as its animals and arid landscape. 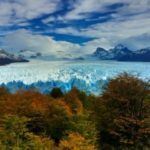 So just for your daily dose of wanderlust travel inspiration, I’ve decided to show you photos of the stunning Torres del Paine in Chile’s Patagonia region. 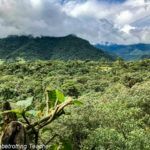 Just for a moment, maybe, the photos will transport you to the southern reaches of South America. 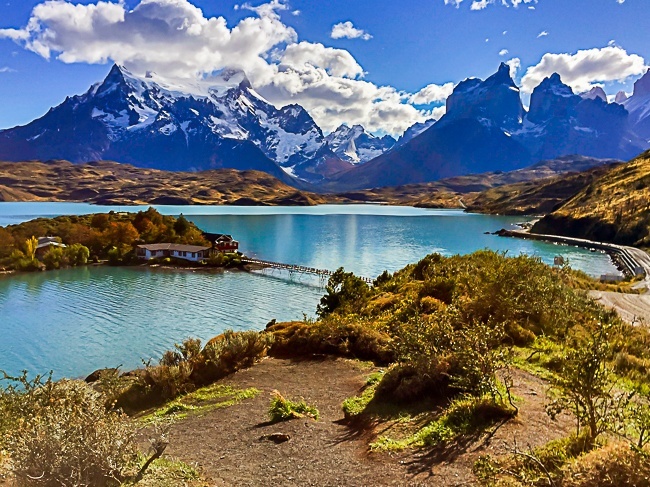 But even better, they just might inspire you to start planning a trip to Patagonia for yourself! 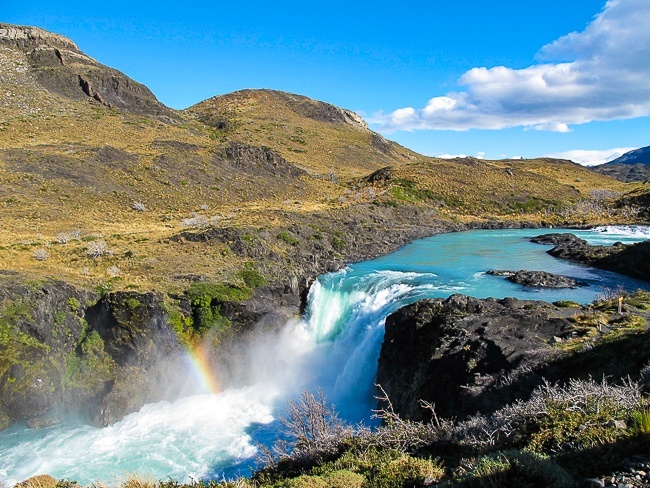 The Salto Grande Waterfall is on the Paine River. Sunlight and misting water make the landscape ripe for a rainbow. You won’t be able to take your eyes off the gorgeous panoramic views of Lake Pehoe and the mountains beyond. Watch for condors. 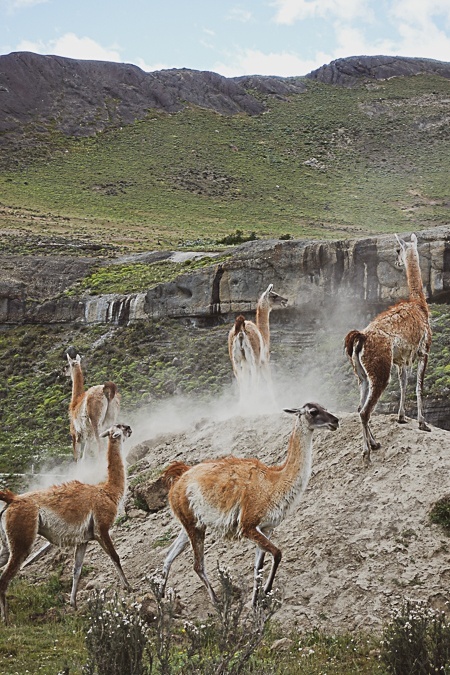 They are the national bird of Chile and can be seen throughout Torres del Paine. 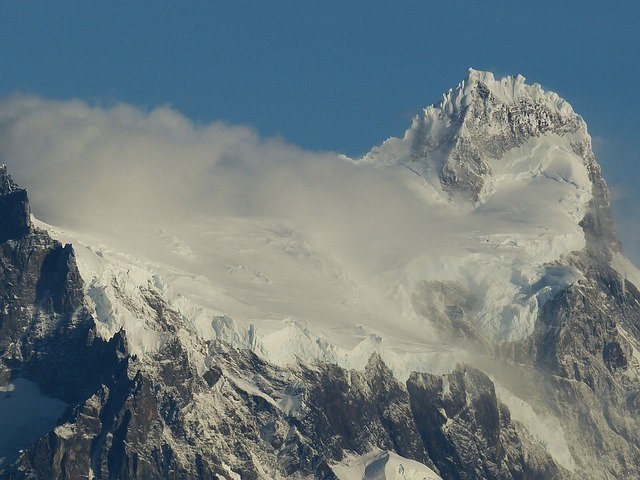 Patagonia and Torres del Paine are well into the Southern Hemisphere. A trip in late March means seeing a landscape ablaze with the reds, yellows, and oranges of Fall. 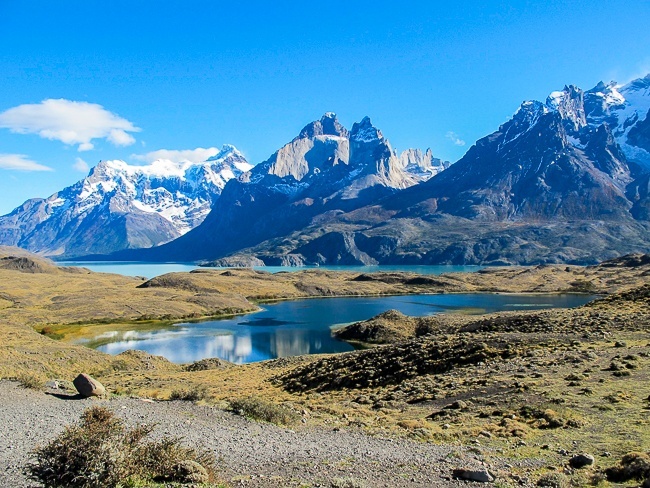 The most popular trek in Torres del Paine is the “W” Circuit. It takes about a week to complete and is about 43 miles long. It’s one of the most bucket list hikes in the world. 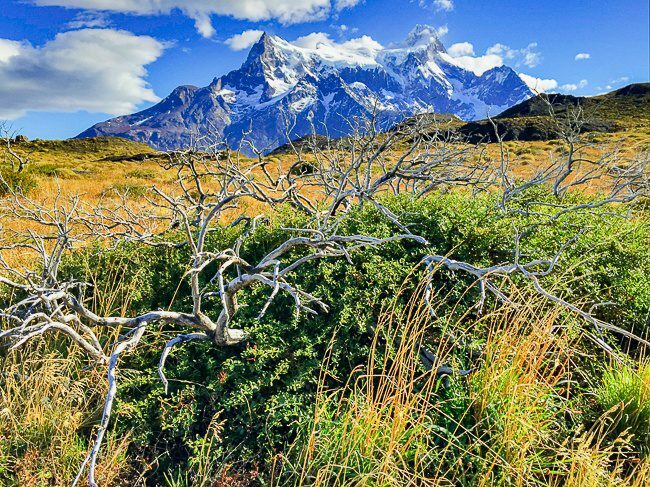 It’s best to visit Torres del Paine on a clear day to fully see its mountain peaks and granite spires. Being prepared is important, though. 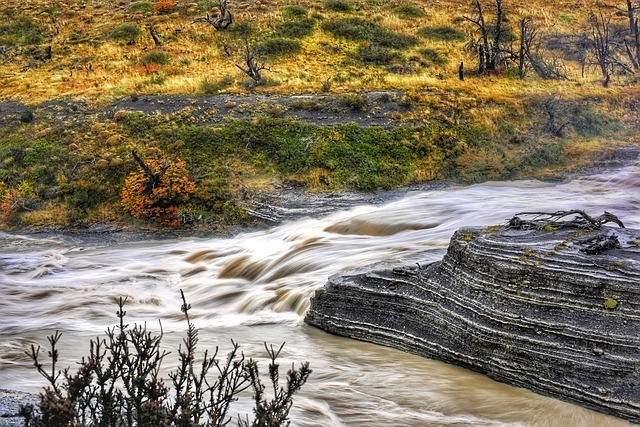 Rugged terrain at the southern end of the planet means weather conditions can shift quickly. 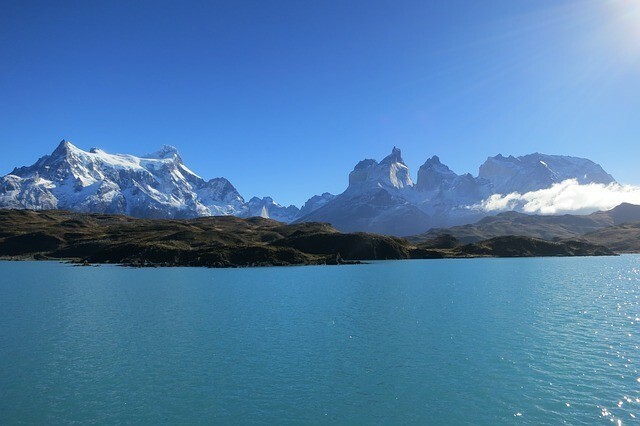 Torres del Paine’s Grey Glacier is the largest in the national park and flows into Grey Lake. 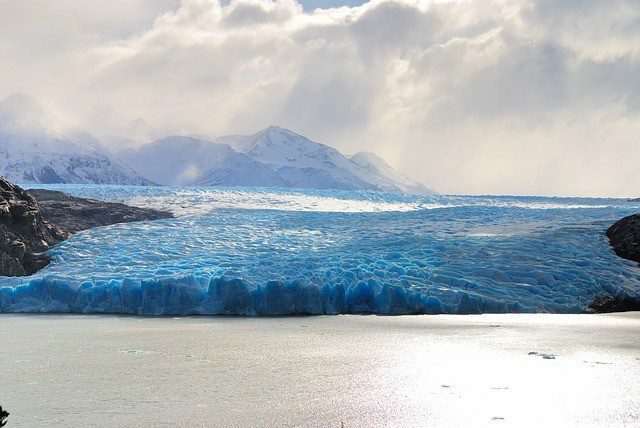 So, have you booked your Patagonia trip yet? Feeling inspired? 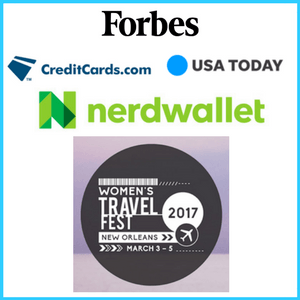 Pin this to your Pinterest travel inspiration board! It’s immense!! So beautiful and pure!! Really wish to go there!! You cannot believe how incredible the natural beauty is, even when you’re standing right there, Ale! That picture with the rainbow is just soo perfect! This post does instill wanderlust me (and i really don’t say this often, since i am more the “ahh..i’ve seen it all” kind of traveler). hope you enjoyed your stay there as much as it looks like. Simply stunning! I’ve travelled all through Central America and the top half of South America – but haven’t made it this far down yet … it’s on the list! You can’t believe the natural beauty right in front of you. It’s that incredible, Steph! Jackie: Good morning. I have signed -up for your newsletters and emails. My family and I are heading to Patagonia this August, via Ascension, PY where my daughter is currently serving in the Peace Corps. After spending a week in PY our plans include a trip to Patagonia. Some perspective: we will have 10 days to tour Patagonia; leaving from Ascension and returning to Ascension. 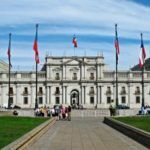 Having read your blog post detailing you trip to Patagonia I am inclined to follow your lead and duplicate your travel itinerary. 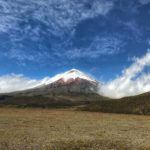 Like you we too expect to do day hikes – avoiding tents and opting to stay in hotels and hostels. Q: given your personal experience would you recommend duplicating your trip? Would you do anything differently? Your thoughtful help will be greatly appreciated. Thanks so much for getting in touch and for signing up for the newsletter. 🙂 Patagonia is spectacular and I’m sure you’ll love it! Overall, I thought my itinerary was good. I got to see and do the things I wanted. If I was going to make a change, I would spend more time in Puerto Natales so that I could have more time in Torres Del Paine. The National Park is just stunning and I would have loved to spend more time there. 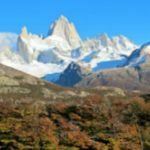 There were day hikes I didn’t do in El Chalten, but with the time I had, I easily did the most popular hikes. If you’re heading down to Ushuaia, I’d definitely recommend looking into a flight back up to Ascension or close to. 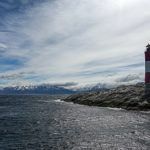 It’s really a long haul down to Ushuaia by bus and, even though I made the journey by bus no problem, I was glad to have the flight back up north at the end of my trip. Let me know if any other questions come up. You can also reply to any email of mine and I will respond, too. I’m happy to help.